Once upon a time, there were these two fellows named Bill and Dave, who made nifty electronic test equipment for engineers, scientists and other nerds (myself included). Then they decided to make printers that would work with their test equipment and computers. As computers got smaller, portable, and more affordable, Mr. Hewlett and Mr. Packard introduced the tiny but mighty ThinkJet 2225. 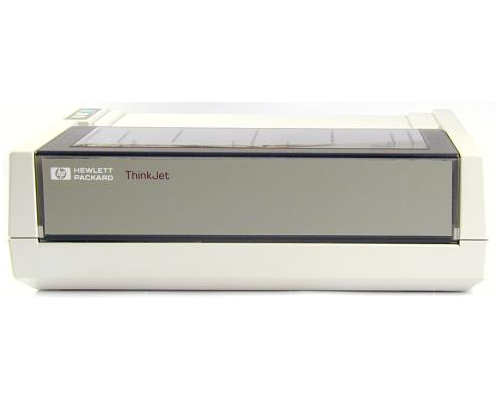 When it was introduced in February 1984 the ThinkJet was the first thermal inkjet printer--superior over dot-matrix printers in print quality, inexpensive, lower power and noise. With today’s bigger and faster inkjet printers, you can still find these 26-year old ThinkJets on many electronic workbenches, still running, still printing happily ever after. When it comes to size, the ThinkJet is smaller than any modern desktop inkjet. At 11.5”W x 8.1”D x 3.5”H and under 6 pounds, its small enough and light enough to be a portable printer. But unless your laptop still has a parallel port to connect to the “C” and “P” sub-models, the ThinkJet won’t find any action supporting road warriors. One of the nice features about the ThinkJet is its ability to use fan-fold (sometimes known as “Z-fold”) paper. If you’re doing long spreadsheets or running thousands of lines of code, it’s nice to be able to see it on one continuous sheet than a bunch of letter or legal-size sheets. If single sheet printing was needed, the 2225 could also accept manual feed of regular paper or transparencies. There is no automatic paper feed for single sheets on the ThinkJet, but it could handle a 5000-sheet box of fan-fold paper, for as long as it had ink. Before the ThinkJet, the concept of “dots-per-inch” as a measurement was new and only to dot-matrix printers could use such a measurement. Daisy-wheel and band/chain (really big, really noisy, really expensive) printers measured resolution in the traditional “characters per inch”, used with typewriters. The ThinkJet’s 96 x 96 dpi resolution could be doubled horizontally to 192 x 96 dpi, providing the same--if not better--resolution than dot-matrix printers available to the home market. One of the main advantages of the inkjet technology was how quiet it was under operation versus daisy-wheel and dot-matrix printers. With a noise rating under 50 dB, the ThinkJet was literally whisper-quiet. Control panels for continuous-feed printers were simple and universal, and the ThinkPad was no exception. Three flush membrane keypads on the upper left column of the printer controlled power, and manual line and form (or page) feeding. Because of its small portable size, HP offered ThinkJets with running on AC line or a DC battery power pack (ThinkJet 2225P, 2225B). This is not the printer you want to use to print your business memos or term papers in 2010 (although in it’s time it did a fine job doing all of that for 1985). 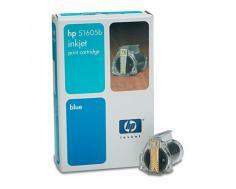 The ThinkJet can’t compete with current inkjet printers in resolution and ink density. However, as a data recording tool in the lab where the only thing you’re interested in is if the data is readable, the ThinkJet is the right printer for the job. This is not an irk against the ThinkJet, but against HP’s mindset of “proprietary-interfaces” when it came to their entire equipment line in the 80’s. While HP did have great test equipment, the biggest drawback was you were forced to use HP connectors, cables, and software. 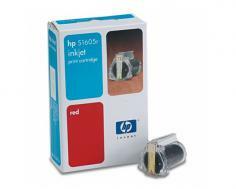 That included their printers until the popularity of standardized serial and parallel buses forced HP to join the party or perish. So the ThinkJet was made in 5 different sub-models: three to support Centronics and serial buses, and two (the 2225A and B) with HP’s proprietary parallel and serial interfaces. If you are looking to buy a second-hand or refurbished ThinkJet, make sure you ask what model they are selling before you buy. Review it: "HP ThinkJet 2225 "
The ThinkJet uses a single black ink “spool” that print up to 550 pages (single or fan-fold). In spite of being a couple of decades old, the ThinkJet’s print yield is better than many of the newest consumer inkjet printers out there.